ADOLF HITLER autograph Signature on Godfather Certificate. German dictator. Leader of the Nazi Party. Autograph signature boldly inscribed in black ink at the foot of a certificate awarded to Gernot Adolf Klein, the son of Friedrich Klein and his wife, Margarette. With the Nazi party eagle device blocked in gold at head and bearing the embossed seal of Hitler's Reich Chancellery at lower left. Berlin. Dated 4th December 1944. TOGETHER WITH an associated certificate and documentation. Approx 11.75 x 8.25 inches. Slight nick at top edge and one or two slight marks, else very good or near fine. Adolf Hitler encouraged members of the Party to have large numbers of children and he personally "sponsored" or stood as Godfather to those who had been particularly productive. 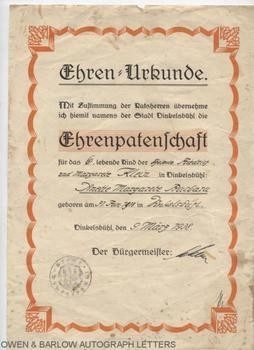 Gernot was the 11th child born to Herr and Frau Klein and included with this item is a certificate signed by Fritz Lechler the Burgermeister of Dinkelsbuhl recording the birth of the couple's 6th child, Anette Margarete Barbara Klein, together with photocopies of their parent's 'log-book' containing their "personalien der eltern" (personal details of parents) and records of the names and dates of birth of each of their 11 children. 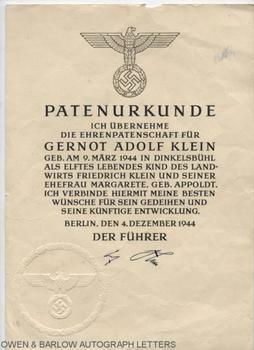 December 4th 1944, the day on which Adolf Hitler signed this certificate, was a momentous one. The tide of the War had turned against Germany and the Allies were closing in. The evening of 4th December saw the hugely destructive incendiary bombing of Heilbronn, Mainz, Koblenz and other cities and, earlier in the day, the Germans had destroyed the Rhine Dikes, flooding the town of Betuwe. On the Eastern front the Red Army were mounting their assault on the Danube. That day, Hitler had met with the Hungarian Prime Minister and Slovak delegation. In the Netherlands, the Germans had made an unsuccessful attempt to launch a V-2 rocket. The mood in the Reich Chancellery must have been unremittingly grim and it is testament to the dogged optimism (or unswerving conceit) of Adolf Hitler that he still took the time to personally sign this certificate.